Polbase - Reference: Visualizing DNA replication in a catalytically active Bacillus DNA polymerase crystal. DNA polymerases copy DNA templates with remarkably high fidelity, checking for correct base-pair formation both at nucleotide insertion and at subsequent DNA extension steps. Despite extensive biochemical, genetic and structural studies, the mechanism by which nucleotides are correctly incorporated is not known. Here we present high-resolution crystal structures of a thermostable bacterial (Bacillus stearothermophilus) DNA polymerase I large fragments with DNA primer templates bound productively at the polymerase active site. 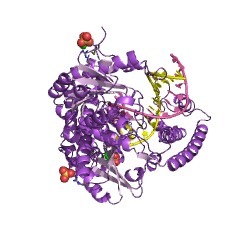 The active site retains catalytic activity, allowing direct observation of the products of several rounds of nucleotide incorporation. 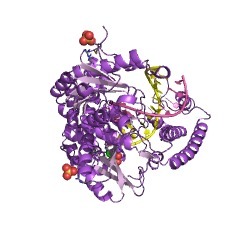 The polymerase also retains its ability to discriminate between correct and incorrectly paired nucleotides in the crystal. Comparison of the structures of successively translocated complexes allows the structural features for the sequence-independent molecular recognition of correctly formed base pairs to be deduced unambiguously. 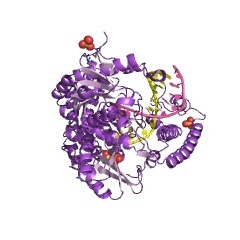 These include extensive interactions with the first four to five base pairs in the minor groove, location of the terminal base pair in a pocket of excellent steric complementarity favouring correct base-pair formation, and a conformational switch from B-form to underwound A-form DNA at the polymerase active site. Crystal structure (1.8A) of the large fragment bound to primer templates (9bp duplex with 5base template overhang) and same after inclusion of the ddTTP (matching the first nucleotide in the overhang) to reveal the formation of the 10th pair of the duplex.